This article is about the minifigure. For the TECHNIC model, see 8009 TECHNIC R2-D2. 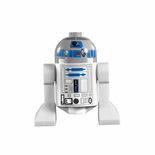 R2-D2 is a Star Wars minifigure first released in 1999, and has been released at least once every year since. The Minifigure of R2-D2 has come in three variations. The first being the most famous standard variation, the mix variation, and The Clone Wars variation. The standard variation, also known as the Classic Variation, is the most famous variation, spanning the LEGO Star Wars theme from 1999 to 2008. Unlike most Minifigures, all of R2-D2's parts were first exclusive (later becoming a standard for other astromech droid Minifigures such as R4-P17) not sharing the same components of standard LEGO Minifigures. He was composed of four parts: the Headpiece, the two leg pieces, and the body piece. The head was shaped like a dome, featuring blue designs all over, making it resemble Artoo's head. The Leg pieces were plain white. The body piece was cylindrical, featuring blue designs on it to make it resemble Artoo's body. He has appeared in this variation in thirteen sets. 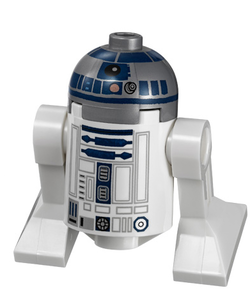 The Bodiless Variation refers to when only R2's head comes in a set. This has been seen in two sets, due to Artoo having the ability to enter vehicles with only his head being exposed in the movies in order to do repairs. He has appeared in two sets in this variation. The New Head Variation is the term donated to the variation of R2-D2 that came with a new head as first seen in the set 10188 Death Star. This R2-D2 minifigure came with the exact same body as the Standard Variation, but utilized a new headpiece. The new head piece had more thick shades of blue compared to the earlier variation, along with a more cartoon-like appearance. He has appeared in this variation in nine sets. The complete new variation uses the exact same pieces as the previous two variations, but has a head that resembles the New Head Variation and the body is reprinted to follow the style implemented in a similar head seen in the New Head Variation; thus a new body print with thicker blue details and less details was created. The body has a more cartoon look just like the new headpiece. This variation has so far only appeared in one set. In the 9509 LEGO Star Wars Advent Calendar, R2-D2 appears as a snowman with carrots on his body and wearing a top hat. C-3PO and R2-D2 in LEGO Star Wars II: The Original Trilogy. 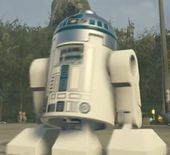 R2-D2 has appeared in all four LEGO Star Wars video games. In the first three, he appears in his original minifigure variation. This variation looks almost completely identical to the Standard Variation, except for the fact that his head could rotate and a third leg sticks out of his body piece when he moves. In LEGO Star Wars III: The Clone Wars he is his The Clone Wars variant. R2-D2, nicknamed Artoo by its various masters, was an R2-series astromech droid, and was undoubtedly the most famous unit of the R2 series. R2-D2 started his existence on a Naboo ship of which Padme Amidala, Qui-Gon Jinn, and Obi-Wan Kenobi, along with other natives of Naboo, used to escape Naboo and reach the Galactic capital Coruscant. The ship's astromech droid repair team were requested to fix the hyperdrive while being blasted by the Trade Federation in space. Artoo succeeded in repairing the hyper-drive, thus saving the lives of everyone on board. The ship soon had to stop at Tatooine. There, the ship's crew recovered a new hyperdrive and Artoo befriended the young Anakin Skywalker and C-3PO. Artoo soon helped in the recapture of Naboo. Soon, R2-D2 became an ordinary companion of the now-Jedi Knight Anakin Skywalker, helping in the Battle of Geonosis by keeping Padme alive. At the outbreak of the Clone Wars, R2-D2 served aboard almost all of Anakin Skywalker's Jedi Starfighters, accomapnying the Jedi on countless missions with Anakin, Obi-Wan, and several Jedi, including Ahsoka Tano he even saved himself and Mace Windu after the endurance crashed when Anakin and Windu after Skywalker picked up Jango Fett's helmet which was rigged with explosives by Boba Fett. At the end of the Clone Wars, and Anakin's fall to the Dark Side, Artoo and C-3PO eventually fell into the hands of the Rebel Alliance's Princess Leia, until her ship was boarded. She inserted the plans of the Empire's Death Star inside Artoo and sent him to Tatooine. Artoo successfully brought the plans to the Jedi Obi-Wan Kenobi and Luke Skywalker, son of Anakin. Luke soon joined the Alliance, with R2-D2 becoming his X-Wing co-pilot in various missions, including the destruction of the Death Star. The Alliance soon defeated the Empire and afterwards, Artoo continued his duties as Luke Skywalker's co-pilot until the remaining fragments of the Empire could be eliminated. Due to the many printings on his dome and body, R2-D2 is prone to printing errors. In 10236 Ewok Village, R2-D2 features his The Clone Wars head, but his live-action body. This page was last edited on 8 March 2018, at 00:24.